OTTAWA — Canada will review the joint vehicle emissions standards it has with the United States before it decides what to do about the U.S.'s plan to weaken those standards in the coming years. Environment Minister Catherine McKenna will unveil a discussion paper as early as Tuesday to kick-start that review, just days after the White House announced it is going to cancel the required annual increases in emissions standards after 2021. Canada and the U.S. have been aligned on vehicle emissions for more than two decades. Unless Canada scraps the existing regulations and writes its own, which could take at least two years, this country will automatically follow the American plan. That plan, agreed to in 2012 by Prime Minister Stephen Harper and President Barack Obama, was to compel automakers to make vehicles more fuel efficient each model year between 2017 and 2025. President Donald Trump, however, is now going to freeze the standards as of 2021. A spokeswoman for McKenna said the review was planned when the regulations were adopted, not as a result of the Trump move last week. Caroline Theriault said Canada will look at both environmental and economic impacts in that review and complete it before any decisions are made on how to proceed. "We are paying close attention to the U.S. mid-term review of vehicle fuel efficiency standards and to the actions of California and other like-minded U.S. states," she said. Canadian automakers don't want Ottawa to make any final decisions on regulations here until it's clear what will happen in the United States. At least 19 state attorneys plan to sue the U.S. government over the rollbacks, including the White House's goal to eliminate a federal legal waiver that allows states to set standards stricter than the national ones. "The reality is because we have always followed what the U.S. has done it makes sense to see what comes out of the other end of the U.S. regulatory review process," said David Adams, president of Global Automakers of Canada. His group represents 15 automakers which sell cars in Canada and will be part of the review process. Among the variables the government needs to explore, Adams said, are whether consumers have behaved the way government and industry expected when the regulations were set, and whether fuel-efficiency technology has been adopted as expected. "Right now, we're finding the market is dramatically different than we maybe anticipated when the standards were first set," said Adams. The biggest change has been the uptick in demand for pickup trucks and SUVs compared to cars. Trucks and SUVs now account for more than two-thirds of auto sales in Canada. 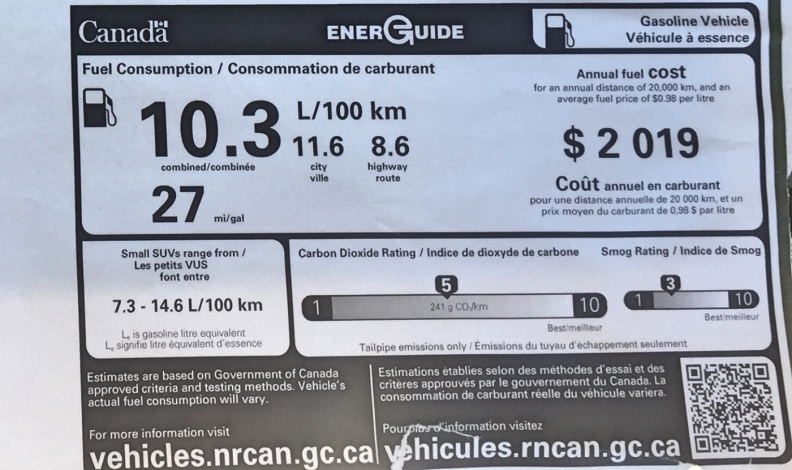 Light-duty gasoline vehicles accounted for about 11 per cent of Canada's entire greenhouse gas footprint in 2016, the most recent year for which emissions data is available, an increase of about four per cent over the previous decade. Canada's aim to cut emissions to be at least 30 per cent less than they were in 2005 by 2030 requires road transportation to play its part. If Canada remains aligned with the U.S. on vehicle emissions and the U.S. does halt further improvements after 2021, the International Council on Clean Transportation last week projected it will add 10 million tonnes to the annual emissions of cars and trucks by 2030, compared to where they would be with the existing standards. Dan Woynillowicz, policy director at Clean Energy Canada, said the U.S. move has introduced a lot of uncertainty for automakers and for Canada, with a multi-year legal battle over the Trump plan expected. "The odds of it being overturned in the courts are pretty high but we're not going to have those decisions for years," he said. Woynillowicz said automakers plan six or seven years ahead and are already preparing for the existing standards so it may be the best business policy for them to proceed as planned no matter what the U.S. does. Electric vehicles also add a variable to the mix, with consumer demand for hybrid and zero-emission vehicles increasing each year. Canada plans to unveil a zero-emission vehiclesstrategy sometime this year and Woynillowicz said the American emissions standards situation may end up affecting that plan. Adams said the industry is committed to making cleaner cars and knows electric zero-emission vehicles will eventually be the whole picture. "It's reasonably clear now the future of the industry is decarbonization," said Adams. "It's just a question of how quickly we go down that path."